Erin Alexander is the Founder, CEO, and Top Social Butterfly of FinallySocial.com. Over the last three years, Erin has grown Finally Social from a boutique social media company to a full-service marketing enterprise. Erin has built strong relationships with clients across all industries with a specialization in Real Estate agents. As an active member of her community, Erin enjoys connecting with other business owners, thought leaders, and referral partners; she is also involved in local non-profits. 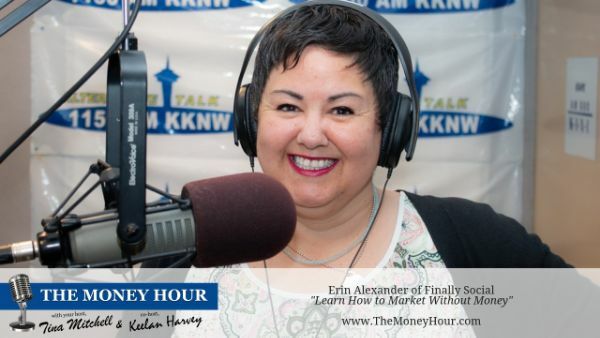 In The Money Hour segment today, Erin discusses marketing without money. Here are the questions that we discuss in this interview! What does marketing without money mean to you? How do you look when your future client researches you online? Let’s talk about your bio…. Why is a bio so important? What needs to be in a bio? Where do we put our bios? Let’s talk about past clients and how 89% of all sales people never touch base with their past clients. Why do you think that past clients are not kept in touch with? What are ways for people to stay in touch? People that say that all of their clients are “referral only” think that they do not need to have a social media presence, why do they? What are the top 3 social media platforms does a business person need to be on? Why and what do people need to share online on social media?